There are so many vehicles clamouring for your attention when you decide to make the step up to a brushless motor, it can be easy to get overwhelmed. After all, there many only have been one criteria you were sure of, and that’s far from the making of a car! Luckily for you, we’re here to analyse one of the most competitive offerings for you – HSP’s 94111TOP Brontosaurus monster truck – and make sense of those fine details! What can you expect from this brushless model? We get under its graphite mixed ABS skin and find out. You might be aware that the 94111TOP is a brushless version of another popular HSP model, the plain ol’ 94111 Brontosaurus. As such, it has replaced the motor and upgraded the battery power – its 2720kV brushless motor beats the original’s 540 class brushed type hands down, as does the 7.4V 3600mAh LiPo battery its little brother’s 7.2V 1800mAh NiMH – but retains many of the great features that make up that excellent basic truck. This will certainly be reassuring if you’ve already owned the cheaper Brontosaurus; after all, it’s just your current truck, but better, so you’ll have an idea of what you’re getting into! But if you haven’t? Let us shed a little light. When examining the features that enhance the vehicles handling and performance, the 94111TOP Brontosaurus distinguishes itself with its brushless electronic speed control (another upgrade on the old Brontosaurus) including both forward and reverse functions, and matches the industry standard with its four wheel drive system and 2.4GHz interference-free method of radio control. Turning is also influenced by the front steering system, which produces a quick turning response from the whole vehicle. Also noteworthy in this model is the extra large radio tray, a speciality of HSP that provides extra stability and protection for the servo and radio system. Not that these are the only parts that are well-protected; a thick, high quality, graphite mixed ABS Monocoque chassis forms the non-moving basis of the vehicle, and an aluminium-crafted upper chassis completes the effect. The high quality car body is necessary in a vehicle that lacks front or rear bumpers, but the number of strength-enhancing and protective features inside also help. An aluminium drive shaft and real oil filled aluminium capped shock absorbers – this time with two for each axle – fitted with professional springs represent a great improvement on the truck’s strength, while the battery box is treated to be waterproof, making it unaffected by dust or damp. To top it all off, the knobbly 105mm off road tyres promise a long service period, giving you great value for money. Other noteworthy features include the full ball bearings, high quality bulkhead, impressive 30mm ground clearance and a gear ratio of 11.1:1. All packed into a truck only 400mm long, that’s quite some spec! In terms of care, any model using a Li-Po battery will be a little more demanding; that’s a given. If you’re considering brushless, though, you’ll be no newbie, so the extra care and attention needed when handling and using the volatile Li-Po battery packs is worth it for their reduced weight and increased efficiency. In terms of running time especially, these beauties are streets ahead, while their higher voltage (7.4 vs. 7.2) means more power and more speed. What’s not to like? And apart from battery care, much of the hard work required by the HSP 94111TOP Brontosaurus truck has already been done for you. 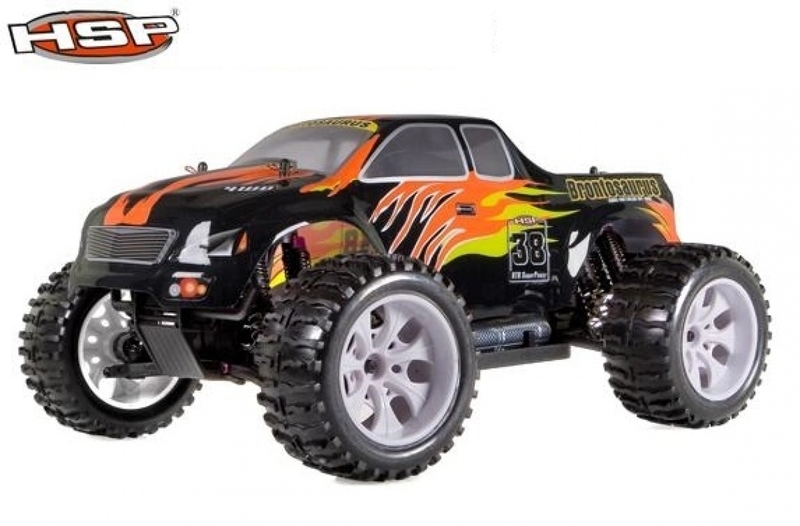 Delivered fully pre-assembled and RTR, the set it comes in also includes a factory-installed 2.4GHz digital proportional radio control system and matching handheld transmitter unit, not to mention a compatible charger for the supplied 7.4V 3600mAh LiPo battery and a manual in English to top it all off. You’ll need to pick up some AA batteries to get the transmitter running, but we wouldn’t exactly call that hard work! So there’s no chance of mistakes in the setup or purchase of extras, and you can get out on that track quickly and confidently. Of course, there is always the (slight) possibility that repairs will be needed. This machine is so durable that we’d be pretty surprised, but if the need arises you can be sure that parts won’t be hard to find. As will all HSP vehicles, there are many spare parts available from the manufacturer, as well as compatible ones from its re-branded subsidiaries such as Red Cat Racing and Himoto. Happily this truck also includes convenience features for hardware maintenance, such as the super easy oil serviceable gears, which also serve to make your life easier. So there you have it: a super-fast brushless monster truck with all of the efficient features that worked so well in the previous models, plus a few more! The most amazing thing, however, is that you’ll only pay about $70 more for the privilege of upgrading – so if you’re thinking about getting yourself a brushless monster truck, then this could be the deal you’ve been waiting for. Consider making it yours – we doubt that you’d regret it!